The Platinum award was earned under the Program for Prevention and Management of HIV & AIDS in the Workplace, from the Manpower Ministry. PT Freeport Indonesia social media was presented with a Social Media Award 2015 under the mining category, from Frontier Consolting Group and the magazine Majalah Marketing. The award is conferred on companies garnering a large share of voice and earning positive sentiment among social media. An award for Biodiversity Development was conferred for publication of books on Birds and Frogs, during the Indonesia Green Awards 2015 event. 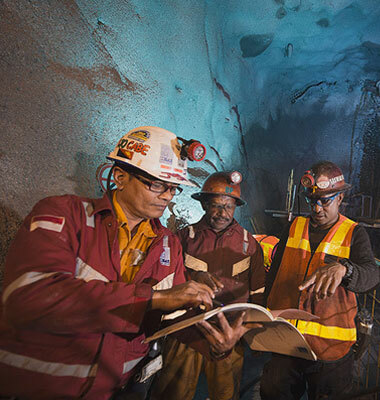 PT Freeport Indonesia earned the highest (Gold Achievement) award at the Operational Excellence Conference and Award 2015 for its accomplishment in the Minegem Productivity Improvement Project. 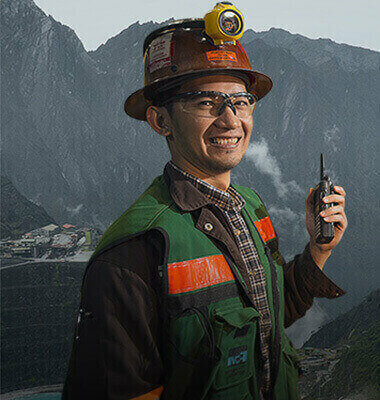 Freeport Indonesia received recognition for Indonesian Best Corporate Public Relations Program 2014 for Program: Crisis Communication Handling Post-Accident in Underground Training Facility, from Mix Magazine. PT Freeport Indonesia’s website was recognized by BeritaSatu.com as Best Website under the Mining and Oil/Gas Companies category. Freeport Indonesia's social media was judges to be the best out of 3 major companies in the Mining category, at the Social Media Achievement Awards 2014 organized by Frontier Consolting Group and Marketing Magazine. Freeport Indonesia earned the title of 'Best Company' for its Nemangkawi Mining Institute Program at the Indonesian Social Responsibility Awards 2014 organized by The La Tofi School of CSR. An award was received under the Category of Biodiversity Management for its 'Development of a Diorama on Endemic Plant Ecosystems at the Mini Botanical Garden and on Butterfly Breeding at the Butterfly Park' during the Indonesian Green Awards 2014 event. The Social Affairs Ministry through a CSR Forum awarded recognition on PT Freeport Indonesia for active participation in Corporate Social Responsibility activites in the area of social welfare provision for remote customary communities (Eka Karsa Padmamitra). PT Freeport Indonesia's Emergency Preparedness & Response Group (ERP) earned the Championship at the 17th Indonesia Fire Rescue Challenge (IFRC). Freeport Indonesia's Biodiversity Program earned the title of Biodiversity Conservationist from La Tofi School of CSR at the Indonesia Green Awards 2013 event. Freeport Indonesia's Emergency Preparedness & Response Group garnered four gold medals during the Indonesian Fire Rescue Challenge (IFRC) Competition organized by the Ministry of Energy dan Mineral Resources, and earned the Best Team Performance title. Six awards for Community Empowerment Achievement (Gelar Karya Pemberdayaan Masyarakat /GKPM) from the Republic of Indonesia Coordinating Ministry for People's Welfare and Corporate Forum for Community Development (CFCD). Three Platinum awards for Economic Development of Village Communities, Prenatal and Antenatal Health Care Services, and Malaria Control and HIV & AIDS Management. Three Gold awards for Program for Improved Nutrition for Children Under the Age of Six Years, 9-Year Basic Education Program, and Creating Access to Clean and Drinking Water and Community Sanitation implemented in Mimika Regency. Best of the Best AIDS Award 2012 for Prevention and Mitigation of HIV & AIDS in the Workplace, from Republic of Indonesia Ministry of Manpower and Transmigration. 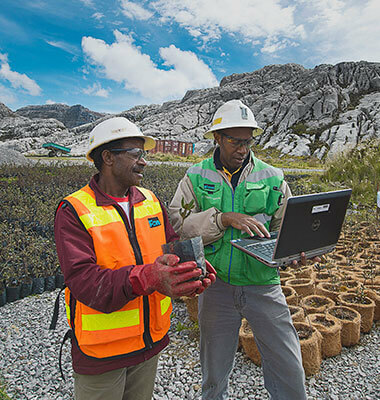 The Best in Mining Industry Category in Strategy-into-Performance Execution Excellence (SPEx2) Award through Program Operation Excellence (OpEx). Freeport Indonesia's Emergency Response Group earned Four Gold Medals during the Indonesian Fire Rescue Challenge (IFRC) Competition organized by the Ministry of Energy and Mineral Resources, and the Best Team Performance. Recognized as one of the Best Reporters of Foreign Exchange Proceeds from Exports (DHE) for the Non-Financial Institution Category, from the Central Bank (Bank Indonesia / BI). This award is conferred on companies reporting foreign exchange proceeds from exports in an accurate, foll and timely manner, and who actively participate in discussions organized by BI on foreign exchange proceeds from exports. Award for the Program of Prevention and Combating of HIV Aids in the work place Platinum Category from the Ministry of Manpower and Transmigration. The Most Admired Company in 2010 by Warta Ekonomi. PT Freeport Indonesia & LPMAK received the Silver and Platinum Awards from the Corporate Forum for Community Development in joint association with the Ministry of Social Affairs, with endorsement of the Coordinating Ministry of People’s Welfare, State Ministry of Low Cost Housing, State Ministry of the Environment, the Ministry of Forestry, Ministry of State Enterprises and State Ministry of the Acceleration of Development in Backward Regions. Strategy-into Performance Execution Excellence Award from GML Performance Consolting & Fortune Magazine Indonesia as Best in Operational Execution. Award from the National Commission for the Eradication of AIDS. Indonesia Green Award 2011 from La Tofi School of CSR & Bisnis & CSR magazine with endorsement from the Ministry of Forestry. Emergency Response Group (ERG) PT Freeport Indonesia (PTFI) Team was awarded first prize in the category Fire & Rescue Challenge (IFRC) ke-14. Award for Contributing to Community Empowerment from the Coordinating Ministry of People’s Welfare and Corporate Forum for Community Development (CFCD). SMP YPJ Kuala Kencana PTFI was presented with the 2011 Adiwiyata School Award by the Ministry of the Environment. “Corporate Image Award 2011” in the mineral sector extended by Bloomberg BusinessWeek Indonesia. Award from the Ministry of Energy and Natural Resources for active participation and assistance in extending disaster relief in 2010. Award for "Good Mining Practice and Best Mining Company” from Tambang magazine. Runner-up for “Best In House Magazine” from Association of Indonesian Public Relations. Overall Winner of 2010 Indonesian Fire & Rescue Challenge (IFRC). Three awards (Platinum, Gold and Silver) for Community Development Program from the Coordinating Public Welfare Ministry and Corporate Forum for Community Development. Gold Award for Environmental Management from ESDM Ministry. Award for Best Housing Complex from the Ministry of Public Housing. Most Ideal Company from Warta Ekonomi Magazine. Overall Winner of the 2009 Indonesian Fire Rescue Challenge (IFRC). Special Reorganization from United Nations’ (UN) “Millennium Development Goals (MDGs)“ for Goal No. 6 i.e. Combating HIV/AIDs, malaria and other infectious diseases. CSR Award for Community Development Program from PNPM. K3 & Environment Award from the Ministry of Energy and Mineral Resources. Award from Bank Indonesia for Forex Transaction Report.